In 1977, Mason and Williams developed the concept of the alveolar epithelial type II (AE2) cell as a defender of the alveolus. It is well known that AE2 cells synthesise, secrete, and recycle all components of the surfactant that regulates alveolar surface tension in mammalian lungs. AE2 cells influence extracellular surfactant transformation by regulating, for example, pH and [Ca2+] of the hypophase. AE2 cells play various roles in alveolar fluid balance, coagulation/fibrinolysis, and host defence. AE2 cells proliferate, differentiate into AE1 cells, and remove apoptotic AE2 cells by phagocytosis, thus contributing to epithelial repair. AE2 cells may act as immunoregulatory cells. AE2 cells interact with resident and mobile cells, either directly by membrane contact or indirectly via cytokines/growth factors and their receptors, thus representing an integrative unit within the alveolus. Although most data support the concept, the controversy about the character of hyperplastic AE2 cells, reported to synthesise profibrotic factors, proscribes drawing a definite conclusion today. As early as 1954, CC Macklin had postulated some of the most important functions of the great pneumocyte, ie the pneumocyte type II or alveolar epithelial type II (AE2) cell (Fig. 1) . Macklin presumed that these cells secrete material that provides low surface tension, enhances clearance of inhaled particles, is bacteriostatic, and helps prevent transudation of interstitial fluid into the alveolus. He further reported that these cells proliferate after lung injury by osmium tetroxide fumes . By 1977, enough data had been collected to stimulate Mason and Williams  to formulate the concept of the AE2 cell as a "defender of the alveolus". It was established that the main functions were synthesis and secretion of surface-active material, hyperplasia in reaction to alveolar epithelial injury, and serving as the progenitor for AE1 cells, which form the epithelial component of the thin air–blood barrier. Nevertheless, several "postulated" functions were listed, for example, secretion of other substances, modulation of the alveolar hypophase, and adaptation in response to lung injury . In the following 23 years, an increasing number of studies revealed many more details concerning the role of the AE2 cell in surfactant delivery and alveolar epithelial repair (see Supplementary Table 1) and a considerable number of supplementary functions have been established (see Supplementary Table 2). This review covers most aspects of current knowledge of AE2 cell functions. Human lung AE2 cells. (a) Scanning electron micrograph of human lung. Two AE2 cells (P2) are seen to protrude above the largely smooth alveolar epithelial surface. A pore of Kohn (K) and the cell–cell junction (arrowheads) between two AE1 cells are denoted. 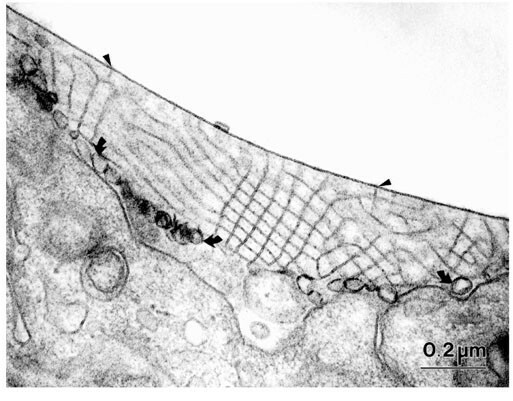 (b) Transmission electron micrograph of human AE2 cell displaying typical ultrastructural features, such as lamellar bodies (Lb) and apical microvilli (arrows). Nu = nucleus. Although the presence of a surface-active agent in the mammalian lung was postulated by von Neergaard as early as 1929 , it was the work of Pattle  and Clements  that opened a new scientific field (for review of historical aspects, see ). This surface-active agent, termed surfactant, was characterised in numerous biochemical studies of bronchoalveolar lavage (BAL) material and is now known to be composed of ≅ 90% (mass) lipids (with ≅ 80–90% phospholipids) and of ≅ 10% proteins. Its composition may deviate greatly in pathologic states (for review, see eg ). Unlike most other lipid-rich components of cells and organs, the surfactant lipids are characterised by an unusually high level of saturated fatty acid chains, such as the predominant dipalmitoylphosphatidylcholines, which contribute substantially to the unique properties of pulmonary surfactant (for review, see eg ). The protein fraction comprises a highly variable amount of serum proteins (50–90% of protein)  and four apoproteins that are associated with surfactant and contribute to its specific functions . Since the 1988 consensus-conference, the surfactant proteins (SPs) have been termed SP-A, -B, -C, and -D . With the progress of cell and molecular biology many aspects of the proteins' structures, genes, and regulation have been established (for comprehensive overview, see ). Surfactant protein gene polymorphisms, already demonstrated for SP-A, SP-B, and SP-D, have just begun to be studied, and may reveal potential new genetic markers or even susceptibility factors for lung diseases such as chronic obstructive pulmonary disease, acute respiratory distress syndrome, or alveolar proteinosis [12,13,14,15]. Cryoscanning electron microscopy of frozen tissue demonstrated surfactant to cover extended areas of alveolar surface as a continuous, thin layer. For methodological reasons, however, this approach was restricted to the outermost subpleural alveoli, and is not applicable to central regions . While chemical fixation allows for the stereological analysis of a collection of tissue samples that are representative of the whole lung, this approach resulted in preservation of surfactant over a fraction of only about 15% of the total alveolar surface despite the use of lipid-stabilising tissue processing . Although definite proof of a continuous covering of total alveolar surface is still lacking, this is a reasonable and widely accepted assumption. Surfactant-like lipid material and SP-A, SP-B, and SP-D have been detected in association with mammalian tissues outside the lung (for reviews, see [18,19]). Surfactant is clearly not restricted to mammals, but is widely distributed within vertebrates [20,21]. Its composition has been largely conserved during vertebrate phylogenesis [20,21], as indicated by studies of the Australian lungfish Neoceratodus forsteri, which evolved about 300 million years ago . Although nothing is known about the presence of surfactant in the vertebrates' closest relatives, the tunicates and acrania, surfactant-like material was demonstrated in the gas mantle of the air-breathing snail Helix aspersa . Thus, it remains to be examined if surfactant has independently evolved more than once with the evolution of gas-containing organs, or if surfactant is a very ancient anti-adhesive material that was developed near the base of the phylogenetic tree. The phylogenetic original function of surfactant in vertebrates can be deduced from studies of non-mammalian vertebrates such as fish, lungfish, amphibia, and reptiles (for reviews, see [18,21]). It has been proposed to be that of an 'anti-glue' to prevent adhesion of the surfaces of gas-containing organs, such as swim bladder and lungs, which might occur during collapse. There are some indications that surfactant acts as an anti-oedema factor in non-mammalian lungs, too . In mammals its primary function is to regulate alveolar surface tension in relation to alveolar size, which is an important clue to efficient ventilation and alveolar stability (for reviews, see [19,24]). According to the equation of Young and Laplace, the actual surface tension is much lower in small alveoles than would be expected from pure geometry. Because neighbouring alveoles communicate with each other via alveolar ducts and pores of Kohn (Fig. 1a), their surface tensions must be different (if they are different in size) in order to prevent the collapse of small alveoles in favour of large ones. Mechanical coupling of alveoles via the interstitial tissue of the septum acts as an additional mechanism to prevent alveolar collapse . However, absence or inactivation of surfactant alone results in alveolar collapse at end-expiration and in atelectasis . Although regulation of surface tension can be considered as the primary function of pulmonary surfactant in mammals, this is only one of a number of different functions . Some critical aspects of current points of view have recently been discussed in detail . Surfactant has long been postulated to prevent the formation of alveolar oedema through the effect of surface tension acting as an additional force to direct net fluid flow across the air–blood barrier [1,27]. The maintenance of fluid homeostasis in the alveolus is considered to represent one of its phylogenetically ancient functions . A comprehensive discussion of the mechanism of surface-tension-dependent alveolar fluid balance predicted by different surfactant models is given by Hills . In order to be effective in keeping the alveolar space free of excess fluid, ions and serum proteins, the AE2 cell is equipped with a number of membrane-bound water channels and ion pumps as well as an albumin-binding immunoglobulin receptor (for review, see ; Supplementary Table 2). However, instead of removing fluid completely, a very thin aqueous film is preserved, termed the hypophase, covering the alveolar surface. The hypophase is delimited at the alveolar face by the surfactant lining layer and at the septal face by the alveolar epithelium. It was estimated to comprise ≅0.37 ± 0.15 ml/kg body weight in sheep . The hypophase can be considered as a reaction milieu for extracellular biochemical processes as well as a 'medium' for intra-alveolar cells such as alveolar macrophages. AE2 cells are thought to control various properties of this extracellular aqueous milieu, for example pH  and [Ca2+] . Since many biochemical processes, such as the extracellular transformation of surfactant (see below), depend on the actual pH and [Ca2+], regulation of these parameters is important for controlling what happens in the alveolus. Furthermore, within a certain distance, any factor secreted into this continuous film is likely to reach other cells within the alveolus. Another function of alveolar surfactant postulated by Macklin , host defence, has attracted major scientific interest in recent years (for reviews, see [32,33]). This function of surfactant relies on the nature of SP-A and SP-D as collectins. Both proteins are able to bind to the surface of various pathogens, thus acting as opsonins to facilitate their elimination by alveolar macrophages [32,33,34]. Moreover, AE2 cells are able to secrete several other products that are involved in host defence, such as the bacteriolytic lysozyme [35,36]. In rat lungs, lysozyme was detected in lamellar bodies of AE2 cells , whereas in humans it was identified in serous submucosal glands but not in alveolar AE2 cells . Originating from an intracellular source, the surfactant coat of the alveolar walls is an extracellular and all but homogeneous material, which can be recovered by BAL. It is synthesised by the AE2 cells and released upon appropriate stimuli by exocytosis from special intracellular storage organelles termed lamellar bodies. Once released into the alveolar space, freshly secreted lamellar body material undergoes several steps of transformation that are necessary to establish the surface-active lining layer. Cyclic compression and expansion during ventilation result in a fraction of spent surfactant that will largely be recycled by the AE2 cells. Thus, single constituents of surfactant may run through several cycles before being removed by alveolar macrophages and replaced by de novo synthesis (for comprehensive review, see ). 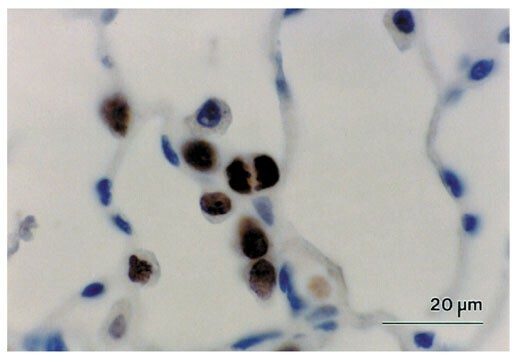 Although the bronchiolar Clara cells synthesise and release the mature proteins SP-A, SP-B, and SP-D (Fig. 2a) [37,38], the AE2 cell is the only type of pulmonary cell that produces all the surfactant components (phospholipids [Fig. 3] as well as all four surfactant proteins). The mature 3.5–3.7 kDa small SP-C (Fig. 2b) is thought to be released by AE2 cells only [39,40]. Indirect immunofluorescence double labelling of rat parenchyma. (a) AE2 cells are stained for surfactant protein D (green) and contrasted by labelling of AE1 cells with Lycopersicon esculentum lectin (red). (b) AE2 cell double-labelled for surfactant protein C (red) and adhesion molecule CD44v6 (green). Transmission electron micrograph of canine lamellar body at high power magnification. The densely packed stacks of phospholipid membranes are bound by a single limiting membrane (arrowheads). The lamellar bodies of AE2 cells have long been recognised as storage granules from which surfactant is released into the alveolus [41,42]. The biochemical composition of this intracellular storage form is largely identical to the composition of the extracellular material obtained by BAL . The stored phospholipids are bound by a limiting membrane (Fig. 3), which is characterised both by typical lysosomal/endosomal  as well as by specific integral membrane proteins  probably involved in intra-cellular trafficking. The lamellar body membrane is further equipped with transport proteins for regulation of internal acidic pH and high [Ca2+] . High levels of Ca2+ interspersed between the stacks of phospholipids were demonstrated by microanalytical techniques . The pathway of lipid and protein synthesis has been traced by means of electron microscopic autoradiography  to involve the organelles of the classical pathway, ie rough endoplasmic reticulum, Golgi apparatus, multivesicular bodies, and lamellar bodies. Immunoelectron microscopy confirmed this pathway for SP-B and SP-C, and by means of double- and triple-labelling, the different steps of processing and maturation of SP-B and SP-C were localised to specific intracellular structures [40,48,49,50]. Although the synthetic pathway of both SP-A and SP-D also involves endoplasmic reticulum and Golgi apparatus, mature SP-D is barely detectable in lamellar bodies . It is thought that SP-D is released via a constitutive pathway , and a subpopulation of lamellar bodies has been proposed to be involved in recycling of SP-D . The problem of differentiating between newly synthesised and recycled proteins is reflected in the controversy of whether or not SP-A is present in lamellar bodies (for review, see ). Although SP-A was detected in lamellar bodies by immunoelectron microscopy  and lamellar bodies have been reported to be enriched in SP-A [53,54], other studies reported only a relatively low amount of SP-A [55,56,57]. These contradictory data may result from the fact that most of the SP-A released into the alveolar hypophase is taken up again by the AE2 cell (see also below). The captured SP-A is directed to the lamellar bodies [57,58], while newly synthesised SP-A is likely to follow a constitutive pathway of secretion . Re-secretion of internalised SP-A may be very rapid, at least in vitro, and may be achieved via a different pathway than the one used by internalised lipids . Little attention has been given to potential species-specific differences, which may be another source for controversial data. Surfactant material is released from its intracellular stores by exocytosis upon various stimuli. A number of physiologic and pharmacologic agents act via β-adrenergic receptors (epinephrine, terbutaline, isoproterenol), P1-purinoreceptors (receptors of adenosine and its analogues) or P2-purinoreceptors (ATP, UTP, ATP analogues; Supplementary Table 1), while several membrane-permeable substances act intracellularly, such as cholera toxin, forskolin, phorbol esters, and calcium ionophores (for review, see ). A number of agents have been reported to stimulate surfactant secretion, such as arachidonic acid, prostaglandins, histamine, and endothelin-1 . Ventilation of the alveolus is a major physiologic stimulus of surfactant secretion and a single deep breath is considered to be sufficient [61,62]. An elegant in vitro study indicated that direct mechanical stretching of AE2 cells can trigger the release of surfactant . However, a recent real-time study examining exocytosis in situ by means of vital stains in isolated perfused rat lungs demonstrated that lung expansion induced synchronous intracellular [Ca2+]-oscillations in all alveolar cells and lamellar body exocytosis in AE2 cells, with the exocytosis rate correlating with the frequency of the oscillations . The authors' exciting conclusion is that AE1 cells may act as mechanotransducers that translate the mechanical stimulus into an intracellular Ca2+ signal, which is transmitted via gap junctions to the AE2 cell to regulate surfactant secretion. Three pathways of signal transduction are now known (for a comprehensive review, see ). The first acts through activation of adenylate cyclase, formation of cyclic AMP and activation of cAMP-dependent protein kinase A. This pathway is followed, for example, by agents binding to β-adrenergic receptors or adenosine receptors A2b. The second pathway acts through activation of protein kinase C (PKC), either by direct interaction with permeable substances or indirectly as a consequence of the activation of membrane receptors. Direct activation of PKC can be achieved by 12-O-tetradecanoylphorbol-13-acetate (TPA) and membrane permeable diacylglycerols (DAGs), while ATP and UTP, for example, activate the PKC pathway after binding to purine receptor P2Y2. The third known pathway acts via an increase in intracellular Ca2+ levels, through either the uptake of extracellular calcium (using ionophores, for example), the transmission of calcium through gap junctions from neighbouring AE1 cells, or the release of calcium from intracellular stores. All of these may activate the Ca2+-calmodulin dependent protein kinase. The release of calcium from intracellular stores, for example, can be induced by binding of ATP to purine receptor P2Y2 and subsequent formation of inositol-3-phosphate. Activation of one of these signal cascades results in an increase in surfactant secretion by about two- to threefold (adenylate cyclase, Ca2+-ionophores) or about fivefold (TPA, PKC-activating agonists). Simultaneous activation of several pathways using several agonists, by mastoparan or ATP, which may activate all three pathways, results in a 5- to 12-fold increase above basal secretion (see references in ). Thus, an enormous redundancy is achieved through the existence of these different pathways of signal transduction and the great number of agonists, which guarantees a high degree of safety in the regulation of surfactant release and underlines the great importance of surfactant delivery to the alveolus. The final step of the secretory pathway is accomplished via the classic mechanism of secretion by exocytosis, which results in the release of surfactant material from lamellar bodies into the alveolus. While it is well established that cytoskeletal components, such as microtubules  and actin filaments , are necessary for transport of the granules to the cell membrane and release of their contents, nothing is known about the mechanisms of release of constitutively formed SP-A and SP-D. Fusion of the lamellar body limiting membrane with the AE2 cell plasma membrane is mediated by annexins . Single cell monitoring may provide new insights into the details of how exocytosis is regulated . Secreted surfactant lipids as well as SP-A may inhibit subsequent surfactant release by negative feedback mechanisms [69,70], although this has not yet been proven in vivo. Once released into the alveolar aqueous hypophase, the lamellar body material transforms into tubular myelin. This is an amazingly regular phospholipid/SP-A assembly (Fig. 4), which gives rise to the surface-active lining layer from which, in turn, small vesicular forms derive that are thought to represent spent surfactant (for review, see ). These categories of surfactant subtypes were defined by early ultrastructural studies and were consistently seen in both chemically and cryofixed surfactant [72,73]. By differential centrifugation of BAL material, surfactant is separated into large and small aggregates, while equilibrium buoyant density gradient centrifugation separates light, heavy and ultraheavy fractions. Correlative studies showed that large aggregates and the ultraheavy fraction correspond to tubular myelin and freshly secreted lamellar bodies, while small aggregates and the light fraction largely represent vesicular surfactant forms [43,55,74]. However, neither do the individual subfrac-tions represent a single ultrastructural subtype [74,75] nor is there congruence of fractions obtained by differential centrifugation and equilibrium buoyant density gradient centrifugation . 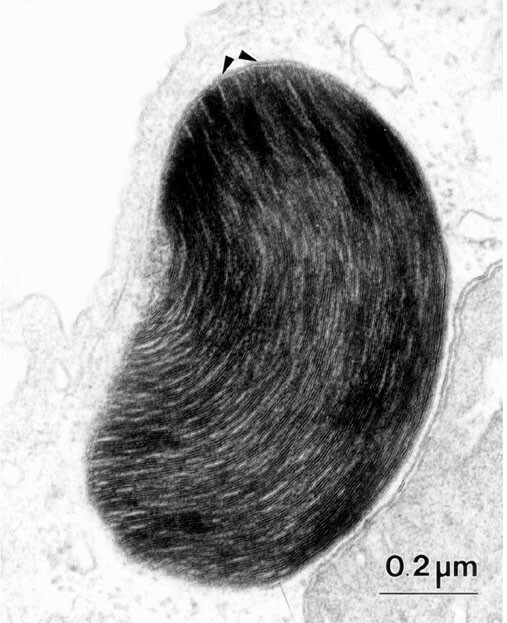 Transmission electron micrograph of rat intra-alveolar surfactant with the typical lattice-like appearance of tubular myelin, which is in close contact with the alveolar lining layer (arrowheads). Vesicular surfactant (small arrows) is seen near the apical surface of the alveolar epithelium. Being an extracellular process, transformation or conversion of surfactant can be studied in vitro. Surfactant subtypes can be reconstituted from individual components [55,77], and surfactant conversion can be mimicked by surface area cycling [74,78,79]. Thus, surfactant transformation was demonstrated to depend on various characteristics of the hypophase milieu, such as concentration of electrolytes , in particular of Ca2+, pH , and the presence of surfactant proteins, especially of SP-A . The first step of transformation of freshly secreted lamellar body material into tubular myelin requires an increased [Ca2+] (probably derived from lamellar bodies ) and SP-A  which is finally observed at the corners of tubular myelin lattices [36,85]. The presence of tubular myelin is thought to be associated with the ability of surfactant lipids to rapidly adsorb to the lining layer at the gas/liquid interface. This second step of conversion appears to be promoted by SP-B (for review, see ). Refinement of the lining layer is the next step that results in an increase in its dipalmitoylphosphatidylcholine fraction, thereby achieving minimal surface tension . This process is thought to involve both SP-B  and SP-C (for review, see [71,86]). The final step of conversion, from surface-active surfactant into inactive vesicular forms, appears to depend on an AE2-cell-derived enzyme termed convertase [88,89]. The balance between large aggregates and small aggregates has turned out to be an important parameter in assessing the functional integrity of alveolar surfactant obtained by BAL (for review, see ). This is corroborated by quantitative ultrastructural studies. While normal lungs showed little quantitative variation in the relative amount of tubular myelin under different ventilation strategies , tubular myelin was considerably decreased in different lung injury models [17,92]. In the context of lung injury, the ultrastructural approach offers the unique opportunity to examine surfactant retained in situ , which allows for the analysis of local surfactant inhomogeneities in relation to other structural changes . 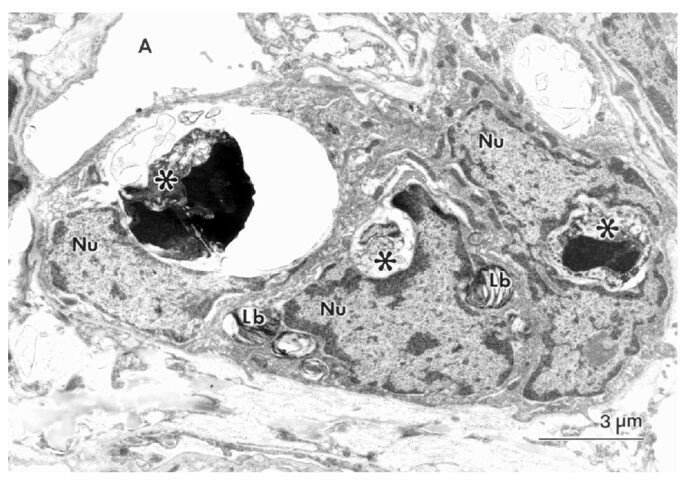 Absence of tubular myelin was associated with reduced intracellular labelling for SP-A and with severe respiratory dysfunction in neonatal respiratory distress syndrome . Paradoxically, targeted SP-A deletion in mice had minor effects on pulmonary function despite a severe depletion of tubular myelin . This discrepancy is still a matter of debate. Today it is established that most of the secreted surfactant — estimated at about 85%  — is taken up again, metabolised and re-secreted by the AE2 cells. Re-uptake and recycling have been demonstrated for surfactant lipids  and all four surfactant proteins [51,58,96,97]. SP-A, SP-B, and SP-C have been reported to enhance the uptake of phospholipids by AE2 cells in vitro; in the case of SP-A at least, this may be a receptor-mediated process [98,99]. SP-D, however, appeared to be ineffective in enhancing lipid uptake . The significance of lipid uptake enhanced by surfactant protein in vivo is still unclear. The intracellular processes of metabolism and recycling are essentially associated with multivesicular bodies, which may exist as functionally heterogeneous populations . Electron microscopic autoradiography  and confocal fluorescence microscopy  indicated that internalised lipids and SP-A are rapidly re-secreted by AE2 cells, probably along different pathways. The degradation of surfactant is accomplished by the alveolar macrophages with only minimal contribution, if any, from AE2 cells. Phospholipids and SP-A appear to be degraded along different pathways . Failure of surfactant removal and degradation may be one reason for alveolar proteinosis observed in transgenic mice lacking granulocyte-macrophage colony-stimulating factor (GM-CSF) . The alveolar epithelium can be classified as a continuously renewing tissue since it comprises a population of cells (AE2) that are characterised by the almost unlimited potential to proliferate. Such a population of cells, capable of both self-maintenance and terminal differentiation, is termed the stem cell population of a tissue. In a continuously renewing tissue, the stem cell population generates a greater progeny than necessary. The excess cells are removed by cell loss to avoid a steady increase in cell mass . Consequently, in the physiological situation, proliferation, terminal differentiation, and cell loss must be in a balanced state which allows for a dynamic regulation of the epithelial cell population. It is still a matter of debate whether all AE2 cells or only a subpopulation act as the alveolar epithelial stem cell population (for review, see ). The time needed to replace all cells of a given population, termed cell turnover time, is quite variable and depends on the specific tissue, developmental stage or age, and pathogenic conditions. It has been reported to last only 2–10 days for bronchial epithelium of adult mammals, and 4–5 weeks for the alveolar epithelium . Cell turnover time may be much faster in case of injury, for example only 3 days in mice after hyperoxic alveolar epithelial damage . This difference is supported by the ≅10-fold increase in alveolar surface covered by AE2 cells within 3 days of in vivo instillation of keratinocyte growth factor (KGF), an AE2 cell mitogen [106,107]. The concept of the AE2 cell as a stem cell of the adult alveolar epithelium was proposed by Kapanci and coworkers , and is widely accepted today (for review, see ). During ontogenesis, the AE2 cell may derive from a precursor cell common to AE2 and Clara cells . In order to divide, the AE2 cell, like any other type of cell, must enter the cell cycle to accomplish DNA replication and mitosis (Fig. 5). The cell cycle is tightly controlled at several checkpoints that control the transition from one phase (G1, S, G2, M) to the next, and it is linked to programmed cell death, thus avoiding replication of cells with genetic defects . Indirect immunoperoxidase staining of rat lung for proliferation marker Ki-67. One day after instillation of recombinant human KGF, many epithelial cells at alveolar corners, the typical AE2 cell location, exhibit nuclear staining. The cell in the centre is just about to complete mitosis. According to [3H]-thymidine labelling experiments, the duration of the complete cell cycle is about 22 hours in AE2 cells of adult mice , which is equivalent to the duration in NO2-injured rat lungs . In mice, duration of cell cycle and of the individual phases appears to depend largely on the developmental stage and the presence or absence of any noxious agents . Notably, the time frames observed in vitro were different from the in vivo estimates (see Table 1 in ). The duration of the S-phase (7–9 hours) appears to be largely independent of species, developmental stage, presence of noxious agents, and cell culture conditions. The duration of G2- and M-phases appears to be most variable (1–12 hours) . The observation that in primary culture only a sub-population of AE2 cells is capable of clonal proliferation with several successive mitotic cycles indicates that AE2 cells are not a uniform population . Nondevelopmental studies of AE2 cell differentiation generally use lung injury models to induce epithelial damage, with the consequence of AE2 cell proliferation and subsequent repair to re-establish a functional air–blood barrier (for reviews, see [115,116]). Recently, differentiation of AE2 cells into AE1 cells has been shown to be involved in the resolution of short-time hyperplasia of AE2 cells following airway instillation of KGF . This approach may be used as an alternative model in the study of adult AE2 cell differentiation. In their fundamental ultrastructure/microautoradiography study of the incorporation of [3H]-thymidine into proliferating cells of NO2-challenged rat lungs, Evans and co-workers  reported that, 1 h after the radiographic pulse, the population of labelled alveolar epithelial cells (≅35% of total lung parenchymal cells) was composed of 88% AE2 cells, less than 1% AE1 cells, and 12% cells that could not be unambiguously assigned to one or both . As has been emphasised by Uhal , this remarkably short time period after which a large proportion of AE2 cells were labelled is a strong argument against any small, yet unknown, stem cell population other than AE2 cells. The study of differentiation of AE2 cells into AE1 cells crucially depends on the possibility to distinguish both cell types. Today, the gold standard is still the complex of ultrastructural criteria with the presence of lamellar bodies, apical microvilli, cell–cell junctions, and cuboid shape, which allows for the clearest distinction of the AE2 cells and AE1 cell phenotypes [118,119]. A number of alternative methods have been validated, such as modified Papanikolaou-staining , cell-type-specific lectins, and immunohistochemical markers [119,121]. The expression of markers, however, may depend on the developmental stage  and can be affected by pathogenic processes . The situation is further complicated by the transient appearance of an intermediate phenotype during differentiation of AE2 cells into AE1 cells after lung damage  as well as after KGF-induced hyperplasia . The most plausible explanation for this observation is that differentiation of AE2 cells is accomplished by continuous transformation into AE1 cells via an intermediate cell type, a concept that is widely accepted today . Isolated AE2 cells cultured in vitro lose their specific features within days and acquire AE1 cell characteristics [124,125,126]. Although this process, which greatly depends on the specific culture conditions , is frequently termed transdifferentiation, one has to take into account that it has not been shown to yield a terminally differentiated AE1 cell. Interestingly, transdifferentiation in vitro is a least partially reversible [125,128]. However, it is unknown if reversibility of the differentiation of AE2 cells into AE1 cells is a potential regulatory mechanism in vivo. One important mechanism of cell removal that was recognised almost a century ago  is programmed cell death or apoptosis . Although an exploding number of studies revealed fundamental details of the inducers, pathways, and effectors of apoptosis in general (for reviews, see eg [130,131]), relatively little is known about apoptosis in the lung in particular (for reviews, see [132,133]). AE2 cells are known to express the membrane receptor Fas (CD95, APO-1), ligation of which may initiate the apoptotic cascade . This can be achieved by binding of Fas-ligand or the Fas-stimulating antibodies. There is some evidence that apoptosis of AE2 cells is an integral mechanism of alveolar septal modelling in lung morphogenesis [135,136]. The presence of many apoptotic cells during the resolution phase after acute lung injury in humans  as well as during epithelial restoration after KGF-induced AE2 cell hyperplasia in rats  indicates that apoptosis may also be an integral part of alveolar epithelial repair. Notably, apoptotic AE2 cells (Fig. 6) appeared to be removed not only by alveolar macrophages but also by AE2 cell neighbours . Knowledge of AE2 cell apoptosis in adult lung physiology and pathology is still rudimentary . Transmission electron micrograph of apoptotic AE2 cells (*) engulfed by their AE2 cell neighbours at day 5 after intrabronchial instillation of recombinant human KGF into rat lung in vivo. A = air space; Lb = lamellar bodies; Nu = nuclei of phagocytic AE2 cells. The mammalian lung comprises more than 40 different cell types . AE2 cells have been estimated to constitute about 60% of alveolar epithelial cells and about 15% of all lung parenchymal cells, while they cover only about 5% of the alveolar surface in adult mammals . These estimates relied on quantitative methods that can no longer be considered adequate, and re-evaluation using modern stereological methods  is much needed. In order to act in a way that is beneficial to the whole alveolus, it is essential for the AE2 cell to interact with its resident as well as its mobile neighbour cells. Consequently, the AE2 cell expresses a number of molecules necessary for the perception as well as the generation of signals involved in cell–cell as well as in cell–matrix interactions. Cell–cell interactions may be direct, ie via contact of the cell membranes, or indirect, ie mediated via secreted and diffusible signals (see Supplementary Table 2). First of all, the AE2 cell is in direct contact with AE1 cells and during proliferation with AE2 cell neighbours as well. These lateral cell–cell contacts within the alveolar epithelium are maintained by a cell junction complex that includes gap junctions . The basal cell membrane is in close proximity to fibroblasts, in particular during the canalicular phase of lung morphogenesis, while modelling of the alveolar septum results in an increase in the spatial relationship of the AE2 cells with capillary endothelial cells of the adult lung . The in situ study of Ashino and co-workers  presented strong evidence of a direct interaction of AE1 and AE2 cells. Mechanical stimulation of AE1 cells is thought to result in [Ca2+]i-oscillations (see above), which are transmitted via interepithelial gap junctions to AE2 cells and modulate exocytosis rate of lamellar bodies . Direct inhibitory interactions between AE1 and AE2 cells have been postulated to suppress AE2 cell proliferation . Loss of AE1 cells during lung injury might then be the trigger to release AE2 cells from growth inhibition. Although E-cadherin, a candidate mediator of contact inhibition , has been localised to the basolateral membrane of adult human AE2 cells , experimental evidence for contact inhibition of AE2 cell proliferation by AE1 cells still remains to be presented. The most intensely studied example of an indirect AE2–AE2 cell interaction is probably the negative feedback loop by which SP-A, released into the alveolar space, inhibits surfactant exocytosis in vitro . Although AE2 cells are equipped with membrane receptors for SPA , the in vivo relevance of this autocrine mechanism by which AE2 cells may regulate their own action is still not convincing (as pointed out recently ). Since mice that are deficient for SP-A did not show any defect in surfactant secretion nor any respiratory deficiency , there must be some alternative mechanism compensating for the loss of a SP-A feedback loop, if present at all. Another potential feedback mechanism that has been postulated is the inhibition of AE2 cell proliferation via AE2-cell-derived transforming growth factor (TGF)-β in bleomycin-induced experimental lung fibrosis . A number of growth factors are released by AE2 cells, which might act in an autocrine way via the corresponding receptors expressed by AE2 cells (see Supplementary Table 2). The interaction of AE2 cells with fibroblasts is probably the best studied reciprocal cell–cell relationship which is relevant to the modelling of alveoles during lung morphogenesis (for review see, eg, ) as well as during remodelling associated with alveolar repair following lung injury (for review see, eg, [123,150]). Both direct and indirect cell–cell interactions have been reported, in most instances from studies of cells grown in culture. The supernatant of fibroblast cultures can increase the proliferation rate of rat AE2 cells, while the AE2 cells have been reported to secrete a factor that inhibits fibroblast proliferation . In contrast, however, an increase in fibroblast proliferation was seen if both cell populations grown in co-culture were able to establish direct cell–cell contacts . In addition, AE2-cell-derived factors may affect extracellular matrix formation by fibroblasts, such as stimulation of collagen type I secretion by AE2-cell-derived insulin-like growth factor (IGF) type 1 . On the contrary, surfactant lipids may reduce collagen type I synthesis, and provoke fibroblast apoptosis, an effect partially reversed by SP-A . Transmission electron microscopy has demonstrated the existence of cell membrane protrusions termed foot processes that traverse the epithelial basal membrane and are likely to represent the structural basis for direct contacts with fibroblasts and/or extracellular matrix . Immuno-electron microscopy indicated that CD44v6 (Fig. 2b) is localised at the tips of these foot processes . The CD44 molecules constitute a family of integral membrane glycoproteins that act as receptors of hyaluronan and osteopontin, for example, and are well established as being involved in epithelial cell migration and differentiation . Little is known about the interaction of alveolar epithelial and capillary endothelial cells. 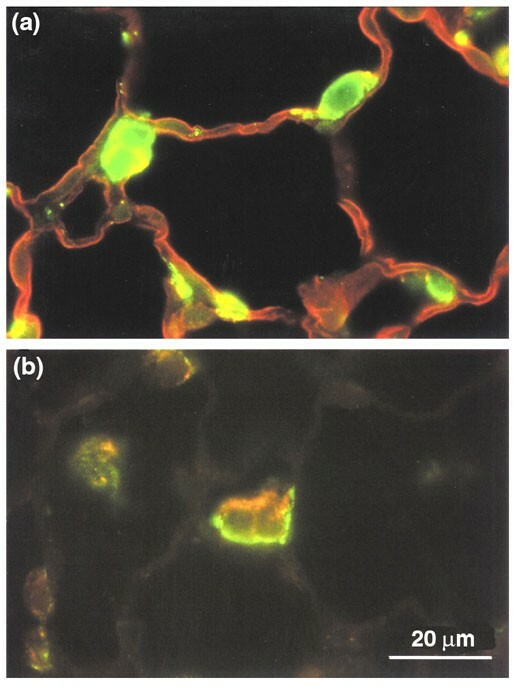 Pulmonary endothelial cell conditioned medium was reported to stimulate foetal lung epithelial cell growth . Freshly isolated rat AE2 cells grown on lung vascular endothelial cell-synthesised matrix showed an increased rate of proliferation and a more rapid transformation into an AE1-like phenotype than cells grown on plastic or matrigel . Since no other cell-derived matrices were studied, the specificity of this effect remains to be shown. Endothelin-1 was observed to increase AE2 cell surfactant secretion in vitro via a protein kinase C and Ca2+-mediated pathway . As a source of endothelin-1, endothelial cells are therefore principally competent to act in a paracrine manner on AE2 epithelial cells, which were reported to express the endothelin receptor A . One has to take into account that AE2 cells themselves may synthesise endothelin-1 and stimulate endogenous prostaglandin E2 synthesis in an autocrine fashion . Recently, a very special mechanism of indirect intercellular communication between AE2 cells and endothelial cells has been suggested based on in situ fluorescence imaging studies in alveoli of isolated perfused lungs . Stimulation of alveolar epithelial cells with tumour necrosis factor (TNF)-α was reported to increase epithelial [Ca2+]i and to activate epithelial cytoplasmic phospholipase A2, and results in basolateral release of arachidonic acid. Free arachidonic acid is thought to increase endothelial [Ca2+]i and expression of P-selectin , which is known to be crucial for initiation of leukocyte adherence. Thus, AE2 cells may act as transducers of an inflammatory signal from the alveolus to the capillary bed to recruit granulocytes to the site of inflammation. Among the multitude of secretory products synthesised and released by alveolar macrophages (for reviews, see [123,161]) there are some factors that act as mitogens for AE2 cells, such as hepatocyte growth factor  and heparin-binding epidermal growth factor-like protein . Conversely, AE2 cells were shown to express the chemokines RANTES and MCP-1, which chemotactically attract macrophages , as well as GM-CSF [165,166], which in turn may stimulate macrophage growth . Furthermore, SP-A released from AE2 cells may modulate macrophage functions such as, oxygen radical release , and nitric oxide production . One has to take into account, however, that there may be species-specific differences [162,163]. Interactions of AE2 cells with leukocytes have just come into focus. AE2 cells may synthesise some cytokines affecting leukocytes, such as interleukin (IL)-6 or IL-8 (see Supplementary Table 2). Via these cytokines, AE2 cells might be involved in the induction of differentiation of basophil, eosinophil, and neutrophil granulocytes and maintenance of inflammatory reactions. Recent data support the idea that AE2 cells have an accessory function in T-lymphocyte activation . This has been suggested on the basis of the finding that the cells bear receptors of MHC class II . AE2 cells were reported to inhibit lymphocyte proliferation in vitro without altering their activation state . AE2-cell-derived TGF-β  may indirectly inhibit T-cell proliferation via blockade of activating factors, such as IL-2. In contrast, GM-CSF released at the basolateral surface of AE2 cells may increase the potential of dendritic cells to induce T-cell proliferation . Isolated human AE2 cells as well as the A549 cell lines can be stimulated by TNF-α to secrete MCP-1 and RANTES at their apical membrane and showed increased expression of ICAM-1 and VCAM-1 . These AE2 cell reactions were associated with increased transepithelial migration of monocytes in baso-apical direction. Direct interaction of pneumocytes with migrating monocytes was reported to be mediated by β2-integrins CD11b/CD18 and β1-integrins as well as by CD47 . Adhesion of stimulated neutrophils has been reported to result in oxidant-independent death of AE2 cells , while in turn one may speculate that AE2 cells may be involved in initiating apoptosis of neutrophils, an important mechanism for the resolution of inflammation . The concept of the "defender of the alveolus" implies that severe damage to or loss of AE2 cells results in a considerable vulnerability of the alveolus. The impairment of pulmonary surfactant as a source of alveolar compromise is probably the best-documented example of AE2-cell-related pulmonary dysfunction (for a comprehensive review, see ). Because intra-alveolar surfactant is highly susceptible to inactivation by serum proteins or reactive oxygen species (for review, see ), very few studies presented data indicating that the primary effect resulting in respiratory dysfunction was indeed a defect in AE2 cells . It is still a matter of debate if hyperplastic AE2 cells, which are frequently observed in pathologic states (for reviews, see [144,178]) and which show altered expression patterns of many components and products , are beneficial or harmful to the alveolus. There are several indications that hyperplasia of AE2 cells may be a cause of pulmonary fibrosis (for review, see ). Unlike normal human AE2 cells, hyperplastic AE2 cells of fibrotic human lungs were reported to produce TGF-β1 [180,181], platelet-derived growth factor (PDGF)  as well as TNF-α , major profibrotic factors. These findings are diametrically opposed to the concept of AE2 cells as the defender of the alveolus. On the contrary, AE2 cell hyperplasia induced in rats in vivo by instillation of recombinant KGF protein or by transfer of the gene encoding KGF did not result in fibrosis [106,107,183]. Moreover, experimental induction of AE2 cell apoptosis was shown to result in pulmonary fibrosis . Notably, apoptotic AE2 cells were enriched in areas of active lesions in close proximity to myofibroblasts in fibrotic human lung . This again supports the notion implicated by the defender concept that loss of AE2 cells has a detrimental effect for the alveolus. Many studies have confirmed the beneficial effect of the AE2 cell for the maintenance of a functional alveolar unit in many aspects. Our knowledge of the cell–cell interactions of AE2 cells still remains to be expanded. Even less is known about the significance of AE2 cell apoptosis and of AE2-cell-induced apoptosis of other cell types, and the relationship to repair and/or pathogenesis. Although most of the data collected to date support the concept of the AE2 cell as a defender of the alveolus, the controversy about the character of hyperplastic AE2 cells, however, proscribes drawing a definite conclusion. Over the last decade I have had the pleasure of working with many colleagues, and of profiting greatly from the stimulating discussions we have had about many aspects of pulmonary research. Many thanks to all of you. This work was supported by the German Bundesministerium für Bildung und Forschung (FKZ 01ZZ5904).